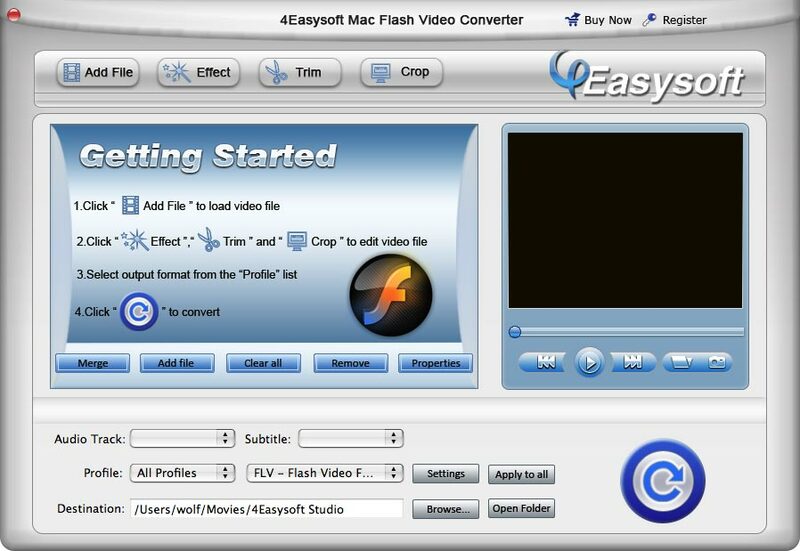 4Easysoft Mac Flash Video Converter is a two-in-one Mac video tool – Flash to video converter and output editor to edit and convert FLV, SWF from YouTube, MySpace to popular video like MPEG-4, H.264/MPEG-4 AVC, AVI, ASF, WMV, 3GP, FLV, SWF, VOB, HD MPG, HD TS for Mac users to be enjoyed with portable devices like iPod, iPhone, Blackberry, Mobile Phone etc on the go. Also you can obtain music AAC, AC3, FLAC, MP3 easily. 4Easysoft Mac Flash Video Converter highlights with its powerful edit options (including Trim, Crop, Merge, Preview etc), faster conversion speed, advanced audio and video setting parameters, and so on. And with our cool Flash video converter for Mac users, you can add watermarks and subtitles to the videos; also users can select output audio tracks. This cool software also supports batch processing which allows you to output different formats simultaneously. Free download Flash Video Converter for Mac to convert Flash to AVI/MP3 on Mac. You are allowed to input FLV, SWF and output MPEG-4, H.264/MPEG-4 AVC, AVI, ASF, WMV, 3GP, 3GPP, FLV, SWF, VOB, DV, Super VCD, VCD, DVD, HD TS, HD WMV, HD MPEG 4, HD MOV, HD ASF with perfect quality and screaming speed. 4Easysoft Mac Flash Video Converter assists you to get MP3, AAC, AC3, AIFF, AMR, AU, FLAC, MP2, OGG, WAV, WMA audios to listen enjoyably. iPod, iPhone, Apple TV, PSP, PS3, Wii, Zune, Google Phone, Sony Walkman, Archos, Creative Zen, iRiver, BlackBerry, Motorola, LG, Sony Ericsson, Mobile Phone, etc. The program’s editing section allows you to get any video length you want with Trim, just drag the process bar to the trim points you want; cut off the black edges and unwanted video area easily or select available aspect ratio (Keep Original, Full Screen, 16:9 and 4:3) with Crop; If you want to put the several video files into a single one, just check the option "Merge into one file" to apply it. If like, you can adjust the video brightness, contrast, saturation to have a fun visual enjoyment. Meanwhile, you can check Deinterlacing to get better video quality. 4Easysoft Mac Flash Video Converter is equipped with more output setting parameters like video Encoder, Frame Rate, Resolution, Bitrate and audio Encoder, Channels, Bitrate, Sample Rate. Especially, the video Resolution lets you input your devices compatible resolution in Width (pixels)*Height (pixels) form then save all the output settings as your preference in the user-defined column automatically for future use. You can preview the input and output video files to compare their effects and adjust them until they are what you want exactly and correctly. Capture the snapshot images if you like to save in the default folder. You are expected to enjoy the converted video and audio with easy steps with the help of the intuitive streamlined interface. And you can also enjoy a faster conversion speed with optimized 4Easysoft Mac Flash Video Converter in less time.